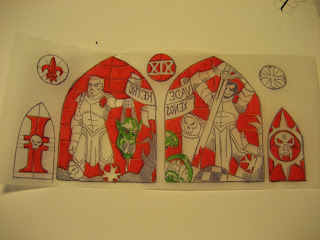 I received several emails and messages in regards to the stained glass window I did last week for the command island. 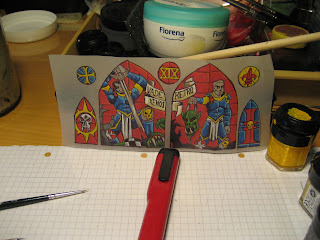 So here's a step-by-step on how to do those stained glass windows. 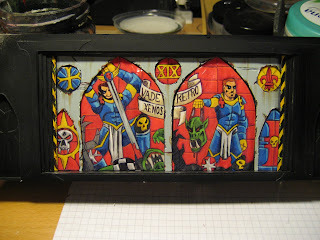 For this I designed an Imperial Propaganda theme "Vade Retro Xenos" - "Begone Xenos!" 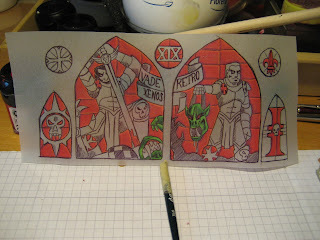 depicting an Imperial Champion killing an Ork and showing the chopped head. 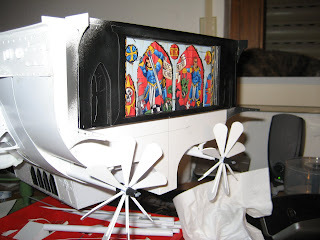 The window will be positioned at the rear end of my ATHENA airship, and provide light to the hangar, as well as it is to motivate the crew while working in the hangar (well, that's the fluff at least). 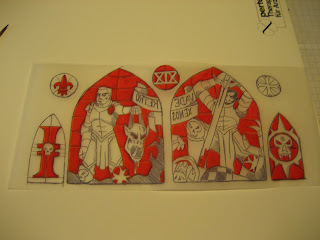 So here's the pencil freehand, with some additional symbols like the XIX division logo, a fleur-de-lil, templars cross ect. 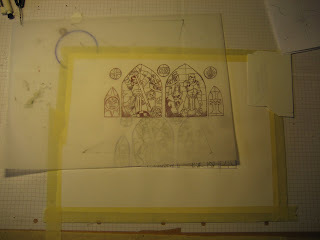 Next I copied the image with a fine black pen onto a sheet of transparent paper. 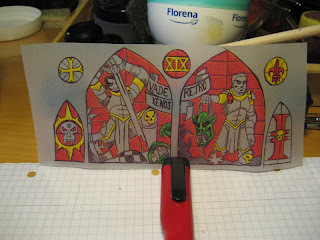 Then I flipped the transparent paper over to its backside - this is where all the paining happens. 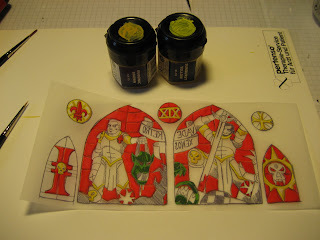 For stained glass one paints from front to back. 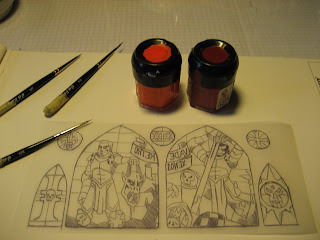 Which means you must start with the highlights and shadows, as well as any details, and then do the main color. 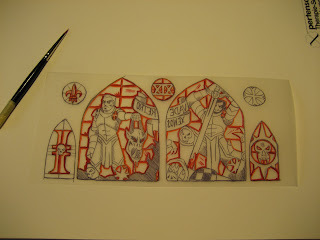 So here I started with the red, using Blazing Orange for the highlights and Red Gore for the Shadows. 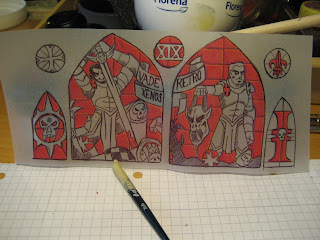 Using it on all the background window tiles as well as the actual red items. When flipped back to the front it looks like this. Then the remaining red items are filled with Blood Red. And from front you get the first impression on how this works out. Next was green. Goblin Green for the highlights and Dark Green Ink for the shadows. 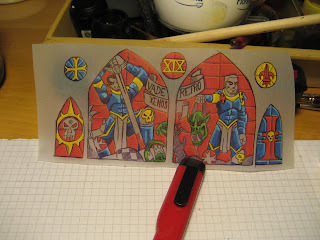 Filled with Green (I use my own mixture for Ork hide) it looks like this. 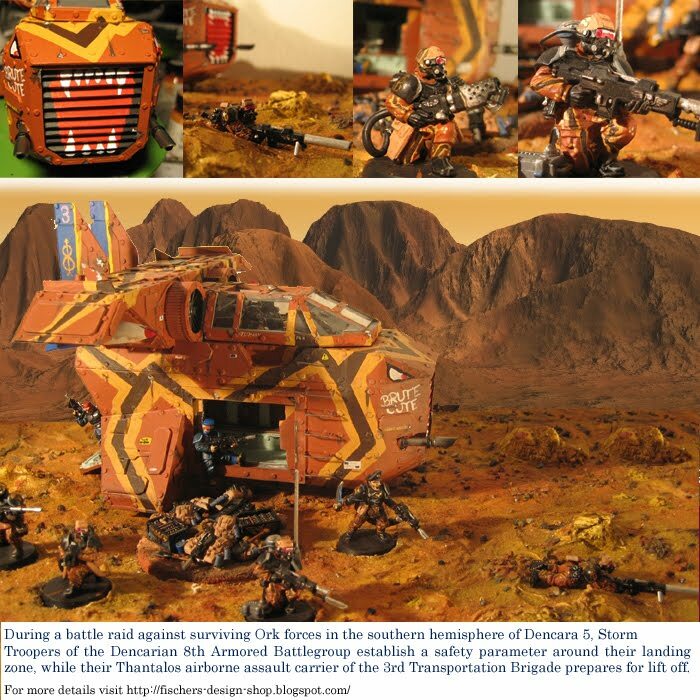 For this I used Sunburst Yellow for the highlights and Bubonic Brown for the shadows. Filled with Golden Yellow it looks like a nice gold mix. 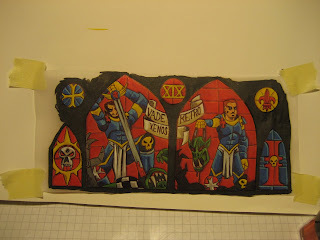 For the blue items I started with Ice Blue for the highlights and Midnight Blue for the shadows. Enchanted Blue completes these items. 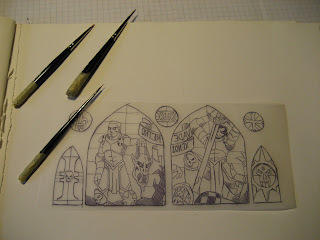 Then I continued this way with the details. 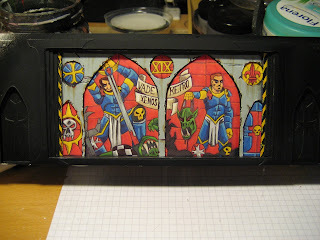 Finally I applied a layer of Chaos Black around the windows itself. And this completes the actual window work. 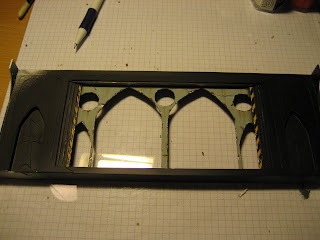 To mount the window I completed a part of the rear structure that will hold the window. 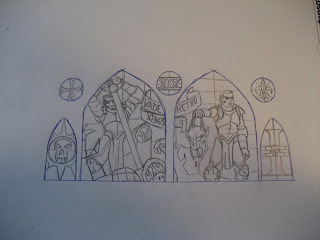 Since I'm not yet sure about the final paint scheme of the ATHENA itself, I limited the work to the actual window frame. 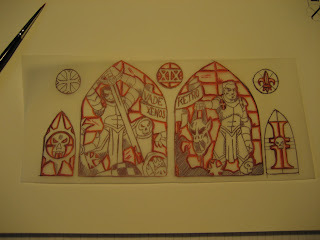 Then I glued the transparent paper from the backside to the frame. 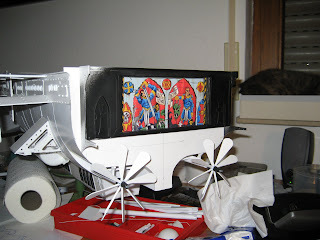 To give it a more glassy apearance (and to cover some of the glue spills I produced) I gave the windows a glossy finish with 'Ard Coat. 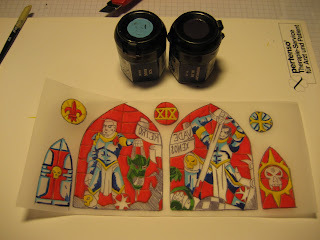 Well, I hope you find this little step-by-step useful and it helps you to create your own stained windows in your next project.